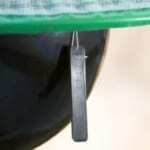 What are the Horse Fly Trap’s Weight and Dimensions? Our horse fly trap weighs a hefty 30 pounds installed. The galvanized corrosion proof steel frame and auxiliary weather resistant parts provide the trap’s long lasting, commercial quality compared to other lighter weight traps on the market. 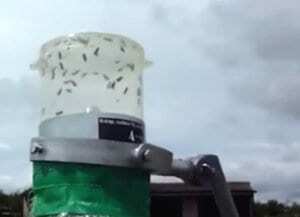 The horse fly trap stands 6.4 feet tall and is 3.9′ wide. What Do Tabanids Look Like and How Do They Die in the Horse Fly Trap? We can’t say it enough: our horse fly trap is designed to catch only tabanids—these are commonly known as menacing horse flies, green heads, deer flies, and yellow flies. Once placed in a hot, sunny location, the black inflatable ball of our horse fly trap will attract the biting female horse flies by natural means. Once on the ball, the female horse fly will find its way to the collection bin via the marine grade plastic funnel. From there, they fly vertically into the collection bin, where they cannot escape, and will die from dehydration or drowning (depending on whether you have added water or not). Does the Horse Fly Trap Have a Warranty? Yes. There is a two year warranty on manufacturing defects from the date of purchase. With reasonable and common sense care, your horse fly trap will last for years to come. For example, if you are anticipating high winds, hurricanes, and other weather storms, we recommend you bring the ball, collection bin, and funnel assembly indoors until good weather prevails. When removing dead horse flies and cleaning the bin, be sure to engage the locking mechanism on the collection bin in order that the lid stays secure. We also recommend that you store your horse fly trap indoors during the winter season. Should you lose parts, don’t worry- replacements are just a phone call away! Is the Horse Fly Trap Easy to Assemble? Yes. 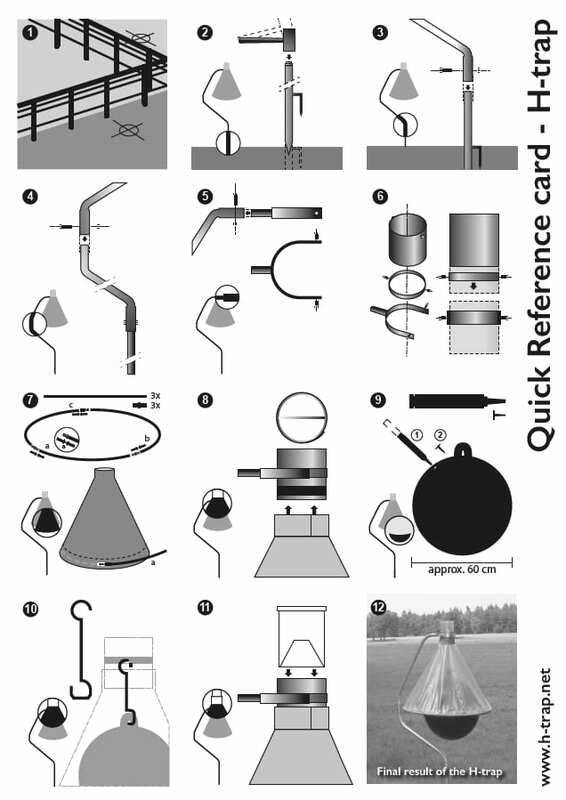 While there are 17 parts, assembly is fast and easy as seen from the quick diagram card. (The U.S. Edition Manual comes with more detailed instructions and tips.) The horse fly trap box contains a hand pump, a wrench, ball plug, and ball plug clip. You may prefer however to use your own tools, such as a socket wrench and electric air pump. And a heads up, perhaps the most difficult challenges your may encounter are: finding the best location on your property to place your horse fly trap to catch these bothersome horse flies; and to make sure you have pretested the ground and cleared it of rocks and other hard objects before pounding your base pipe with its anti rotation anchor rod. Click image to see a larger view. With our advertising and marketing, we make every effort to educate you about the horse fly trap you are buying. We don’t want you buying our horse fly trap for the wrong reasons and caution you to make certain you have tabanids on your property and that you are locating the horse fly trap in the right place. We also take pride in having a quality product to offer you, and a customer service department and in house entomologist who are readily available to answer any problems, concerns, and questions via telephone or email. 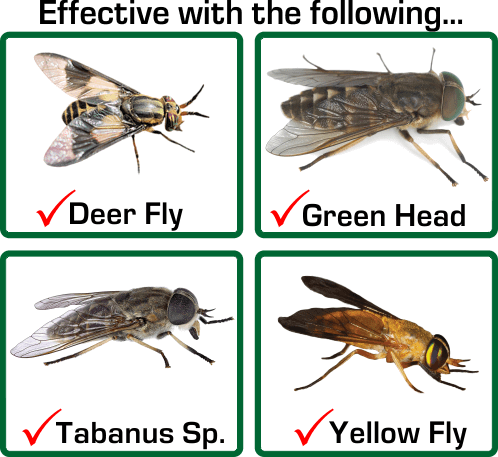 As a result, we get very few horse fly traps back; and if there is an issue, it is typically a mistake in identifying the types of flies that are bothering you, and there are no or very few tabanids on the property! We will accept returns up to 30 days of purchase, but we must first hear from you to authorize any returns relating to a defective/damaged parts or unsatisfactory performance. We will NOT accept any unauthorized returns. If a return is needed and authorized by us, we will issue a Return Merchandise Authorization (RMA) number, which must be affixed on the return package. And, once authorized, we will only accept returned product if it is in the original shipping box and package wrappers and all parts are in working order and undamaged. Once we have inspected the returned merchandise for any damages, etc., we will make a determination as to its refund value, and notify you. Original shipping costs are not refundable. The customer is responsible for all return shipping charges and lost merchandise during return shipments. For a return authorization or questions, please contact Customer Service at (855) 248-3548. We are open from Monday to Friday, 8 a.m. to 5 p.m., except holidays. If in stock and barring any unforeseen circumstances, we ship our horse fly traps via UPS Ground within 1 to 3 business days of an online website order We ship only to residential addresses in the contiguous United States (48 states). We do not ship to Post Office Addresses or on weekends. Expedited shipping is also available upon request for an additional shipping charge. The use of attractive chemical lures such as the Bite-Lite® Biting Insect lure can increase the trap collection. H-Trap’s Superiority in Standing Up to the Elements and Catching Horse Flies!